The trauma chaplains at Oceti Sakowin Camp. [Episcopal News Service – Cannon Ball, North Dakota] When the trauma chaplains who volunteered to go to the Standing Rock Sioux Nation in North Dakota answered the call, none of them knew exactly what to expect. Thousands of military veterans were planning to descend on the Oceti Sakowin Camp just north of the reservation to stand between those opposed to the Dakota Access Pipeline, known as water protectors, and the Morton County Sheriff’s Department and other law-enforcement personnel from across the country. The chaplains and veterans alike had seen news coverage of law-enforcement personnel using water cannons in sub-freezing weather, along with rubber bullets, tear gas, pepper spray and acoustical devices, on the water protectors in late November at the Backwater Bridge on Highway 1806, and wanted to stand in support of the water protectors. Both groups were worried that if violence broke out between water protectors – and their supporters – and law enforcement personnel, a lot of emotional trauma would surface. The Rev. 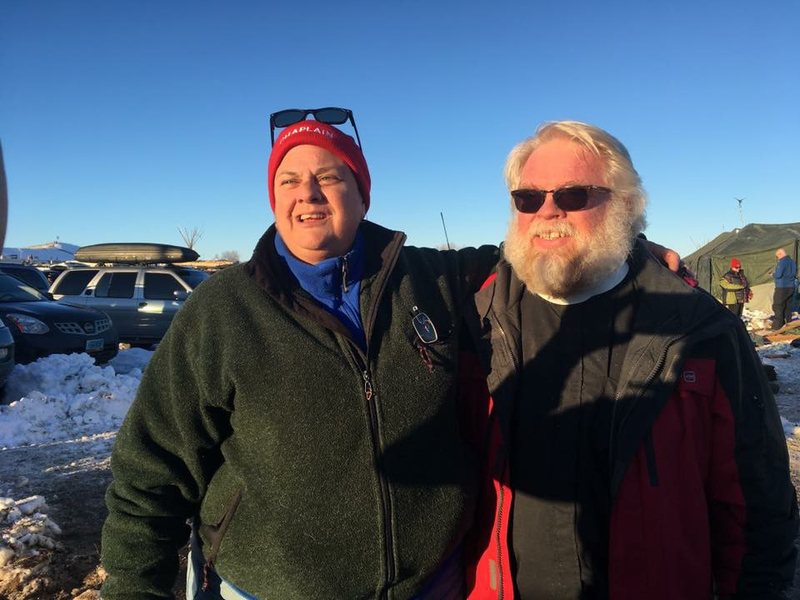 John Floberg, the priest in charge of the Episcopal church on the North Dakota side of Standing Rock, was worried about that potential trauma, and asked the Rev. Canon Michael Pipkin, missioner for missional management in the Episcopal Church in Minnesota, to put together a team of trauma chaplains who could serve all sides of the controversy. 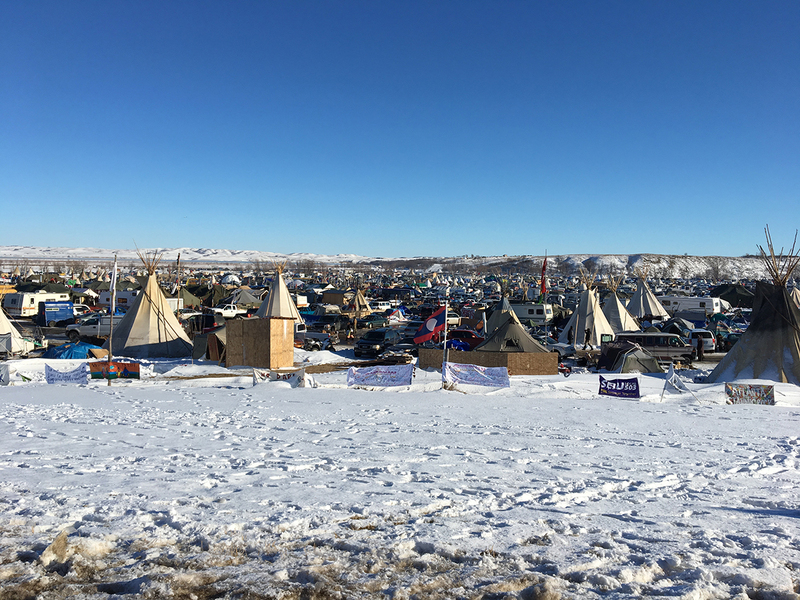 All of the chaplains agreed that the specific invitation from Floberg and the Standing Rock Sioux Tribe leadership was important to their discernment of whether to go to North Dakota. As the chaplains arrived from around the country, they underwent training and orientation, and prepared for what could have been a contentious situation. The U.S. Army Corp of Engineers, which controls the federal land where the main water protectors’ camp was situated as well as the Missouri River, previously had announced that the protectors had to abandon the camp by Monday, Dec. 5. Protectors and veterans alike had vowed to ignore that order, as well as subsequent orders by the state of North Dakota to leave. Then on Sunday, Dec. 4, the Corps announced it was denying the easement permit for Energy Transfer Partners, the pipeline builders, to drill under Lake Oahe, a widening of the Missouri River just north of the reservation. That announcement took everyone involved by surprise. Love was helping to set up that tent when word came that there was important news from the Corps of Engineers. The Very Rev. 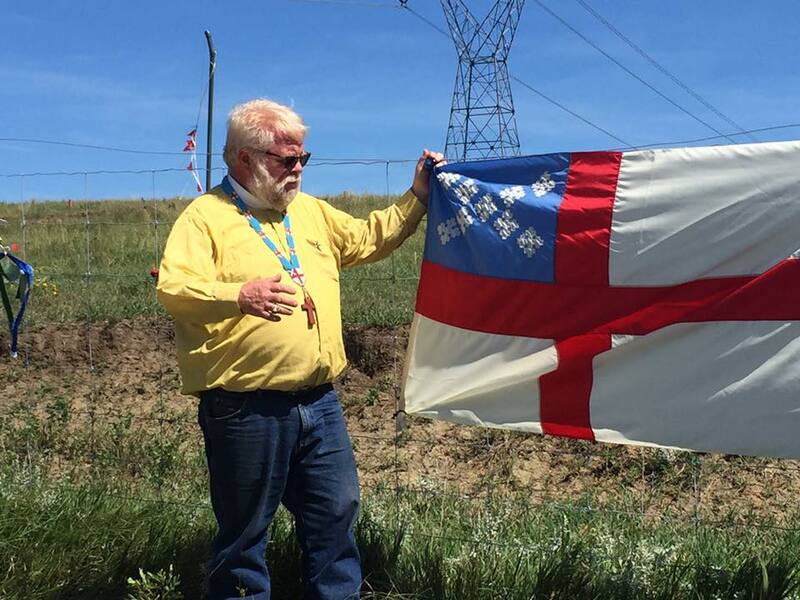 Paul Lebens-Englund, dean of St. Mark’s Episcopal Cathedral in Minneapolis, had planned to come to the Standing Rock because of the eviction announcement, to be a chaplain and to “exercise my privilege to be a witness to whatever happened.” Once Pipkin realized Lebens-Englund was going to be there, he asked the dean to be part of the chaplains’ team. 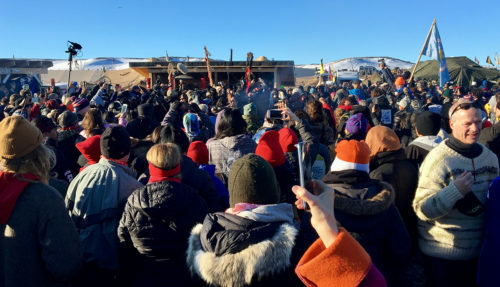 On Sunday afternoon, Lewis BrightHeart PureMountain Headrick, a Soto Zen Buddhist chaplain from Loveland, Colorado, was praying for a missing young man at the Two Spirit Camp inside Oceti Sakowin. As he finished, Headrick went to the chaplains’ tent and learned that people were gathering at the sacred fire. Bradtmiller and the other chaplains spent part of Monday, Dec. 5, working with veterans in several places, both at the camp and at the Prairie Knights Casino, where some veterans had gone to take part in a forgiveness ceremony. Helping people find that intersection between their own experiences and those of others was core to the call for the chaplains, said Pipkin. “I recognize that suffering is an experience that binds human beings together. I hoped to be able to extend the love of these good people toward not just the water protectors but to the veterans, who bring with them a considerable amount of trauma, and the expectation that their trauma would merge with the trauma that is here. On Dec. 5, when it was obvious that the Corps’ announcement and the blizzard had changed everything, “it became really apparent that the chaplains had an opportunity to make a real difference in the lives of people. The challenge was that the vets had very specific kinds of direct action (they were planning to take), but with the shift of the government’s position, the mission for them also shifted considerably. That meant that there were 4,000 veterans looking for a new mission, and a major blizzard was pressing down on the camp, so there was a volatile mix possible,” said Pipkin. “Our chaplains were excellent at reading situations and anticipating where they would be used. … I don’t think we can take credit for peaceful outcomes, but it certainly was a privilege to experience a camp where prayer was the purpose,” he said. 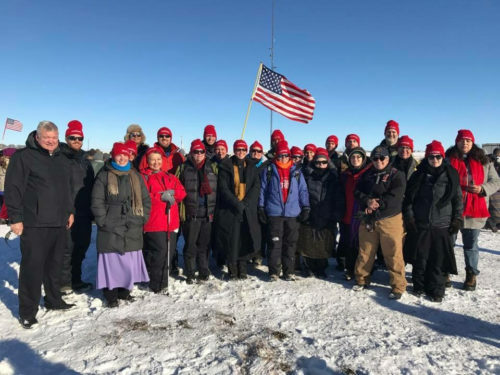 Pipkin added that one of the strengths of the chaplains’ team was that it was multifaith in nature, with Christians of many denominations “walking beside Buddhists and Unitarians and others.” He said that 30 of the 32 chaplains who signed up were able to make it to Standing Rock (two were stranded in the blizzard). There were 10 Episcopalians, three Buddhists, two United Church of Christ ministers, five Unitarians, six Disciples of Christ ministers and four pastors from the Evangelical Lutheran Church in America. – The Rev. Lauren Stanley, superintendent presbyter of the Rosebud Episcopal Mission West in South Dakota, was part of the chaplain team at Standing Rock. Why not now send them out to Aleppo where they are needed ? Jesus Christ, Child of God, Have mercy on us sinners. Thank you for doing this beautiful work. I very much agree that the love from the divine–by whatever name we may call it–is for everyone and that this is so much stronger and more important than anything else. If people do not believe in any divine force, they can still love one another, which is a deeply spiritual act too. No matter what spiritual beliefs we may each have, if we have love in our hearts that is the most important thing of all. No belief or opinion can possibly be more important than love. Love for everyone naturally guides people to peaceful ways of being. It is so wonderful to see a situation in which people were able to peacefully work for what was right. Thank you Lauren for these wonderful words around a shared experience. I hold in my heart the conversations we had in the small bedroom in Khartoum when you were returning and I was leaving. Thanks for the work that all of you are doing. And, going where called. It was a profound privilege to be at the camp, to abide at the church, offer reasonable and specific help to suffering people, and to witness such searing joy on the faces of those who found meaning and purpose in their commitment to be there and do the necessary work at hand. Fireworks went off Sunday night of the Veterans Deployment, if memory served. #NoDAPL Fb Friends were madly concerned and prayerful. Delighted to find this post.. sharing! Best wishes from South Texas. I am looking forward to the undoing of this temporary leftist, ecofascist, Marxist, misguided, theologically vacuous debacle by the incoming Administration.